062.Tamar Schori & Oded Perry – JavaMuseum 2010 – Celebrate! Israeli new media artists dealing with Flash and game like art environments. The Uroboros that swallows its own tail inspires the CycleScope project. As we are swamped by couples of image and words created by search engines one may offer a relief by allowing us to control the flow. Let us reclaim the word and image association by propagating our own associations. Let us detach from machine fabricated realities by slowly tailoring a group view of visual perceptions. Are we swallowing our own tail – reusing the same material that overflows to create even more noise? 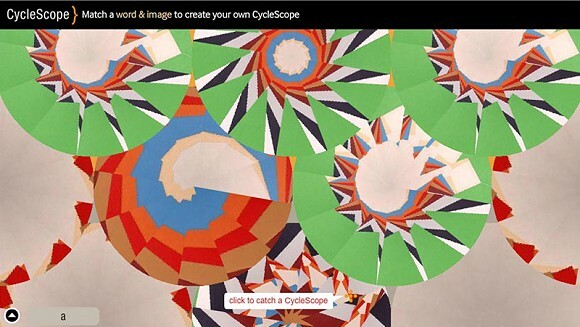 CycleScope allow people to investigate the associated link between a word and an image. Together, you are invited to contribute to a local data base, where a word & image become a literary creation. CycleScope, a web based gadget, is a mechanism that help you match a word of your choice with a selection of images that have been previously uploaded to match this word. Select one or add your own. Your choice becomes a CycleScope, a kaleidoscopic entity formed on the site and kept on the gallery for others to see and use. Successful matches will appear frequently on the gallery, indicating their appeal to sites’ visitors. 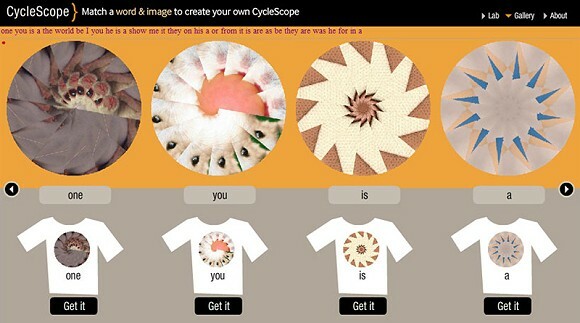 One can buy a redrawn version of a CycleScope printed on a T-shirt or a button via the gallery. keywords: crowd sourcing, DIOS, Semantic Web, literary creation.